Raise awareness of local history, natural history, geography and architecture. Secure the preservation, protection, development and improvement of features of historic or public interest. It has a Planning Sub-Committee that monitors all planning applications in the area and writes to Herefordshire Council about them where necessary. The Society also takes an interest in the maintenance and extension of local Rights of Way. There is also a Publications Sub-Committee that has to date published 20 “ Pink Publications” on various aspects of local history. These are on sale at the Ross Heritage Centre, which is in the upper part of the Market House. The Society puts on monthly talks about local topics – either historical or current – as well as visits to places of local interest in the summer. Normally there is also a visit arranged as part of the Heritage Open Days week-end in September. A newsletter is sent to members three times a year. A sample article can be found here. The annual subscription is £15 for an individual membership or £25 for a joint membership – this includes free admission to all the Society’s talks. Membership forms are held in Ross Library (and other shops around the town) or print out and use the flyer below. 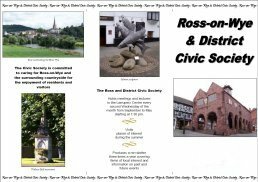 If there are any problems then please contact secretary@rosscivic.org.uk for assistance. Talks are held at the Larruperz Centre 7:00pm for a 7:30pm start. More details on visits and the associated arrangements will be included in the newsletters.